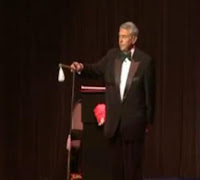 Ronnie Reckseit is a traditional Borscht Belt comedian who skillfully weaves in a sprinkling of comedy magic to create an outstanding program of entertainment. Ronnie's special blend of stand-up comedy and audience interaction has captivated audiences throughout the USA, the Far East and the Caribbean. Performances on cruise ships, hotel venues and adult communities round out his busy schedule. Here's a clip of his act to help you start today with a few laughs. Enjoy!